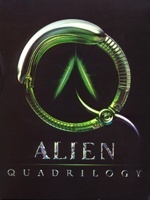 together with "Alien," "Alien" [Director's Cut], "Aliens,"
"Aliens" [SE], "Alien3," "Alien3" [SE], "Alien: Resurrection"
cannot be skipped, fast-forwarding is possible. No THX certification. DTS audio track is missing.